Regeneration is always a tricky thing for Doctor Who and its fans. No other show in the history of television has set itself such a challenge, or placed such a preposterous demand on its viewers. Oh, we’ve been asked to accept New Darrens, and New Beckys, and New Daarios, but no show has built an entire franchise around only one permanent character, and then asked us—every few years—to accept a completely different actor in the role. (James Bond is perhaps the only comparable franchise, and movies—with years between installments, and very little continuity linking them—are a different kettle of fish altogether.) When you think about it, it’s surprising the show survived its first regeneration, way back in 1966, let alone 11 regenerations over fifty years. It really shouldn’t work at all. And yet, somehow, it does. I always counsel new Who fans through their first regeneration by telling them it’s a lot like a bad breakup: at first you will mourn, and you will be angry, and you will fear that you will never be happy with anyone else. But then—much sooner than you expect—you will fall in love again, and you’ll be so happy with the new person that you can’t really remember how you ever lived without them. Sometimes it happens right away. For me, Matt Smith was the Doctor, right out of the box. (Pun intended.) Whatever doubts I had about him from his first, brief appearance in “The End of Time, Part II”—No, he’s too young, and seems kind of spastic—and from seeing the actor interviewed—God, he really does flap his hands about a lot when he talks, doesn’t he?—were completely forgotten the moment he popped his head out of the TARDIS in Amelia Pond’s garden in “The Eleventh Hour.” I adored him on sight, and by the time (just 10 minutes later) that he uttered the words “Trust me, I’m the Doctor,” I did trust him, completely. The Ninth Doctor, Christopher Eccleston, was another almost immediate connection. Very early in his first episode “Rose,” he stops running around and politely introduces himself, and then he says “Nice to meet you, Rose. Now run for your life!” Suddenly, instantly, this complete stranger was the Doctor: you could just see the quintessential Time Lord, Tom Baker, smiling through Eccleston’s face. But, sometimes, it takes longer. We were a full forty minutes into “The Christmas Invasion” before I even began to see Eccleston’s successor, David Tennant, as the Doctor, and it was still several episodes—not very good ones, to be fair—before it began to feel right. But somewhere in his fourth episode, “School Reunion”—aided considerably by the confirmation of classic-series companion Sarah Jane Smith (Elisabeth Sladen)—Tennant, too, became the Doctor. Four years later, when he finally stepped down from the role, it felt like he always had been the Doctor, and it was inconceivable that anyone else could take his place. But it always happens, and you have to trust it: it’s the circle of life, the cycle of being a Doctor Who fan. This was always going to be a tough regeneration. Anyone who has read my reviews before has heard me blather on about what I have been calling the “Moffat Masterplan,” a long-term reconstruction project that is now mostly complete. 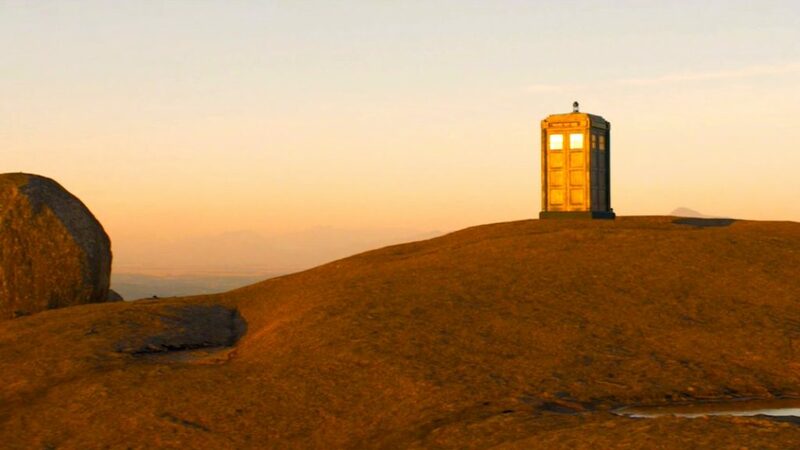 When executive producer Stephen Moffat took over from Russell T Davies in 2010, he could have just rebooted the show in an entirely different tone right from the start—but he didn’t. Instead, he spent three long years patiently reworking the show, within continuity, to undo certain aspects of Davies’ version. Moffat inherited a Doctor who was an all-powerful, messianic celebrity, and he’s been carefully turning him back into the anonymous “cosmic hobo” of the classic series ever since. Some of the more high-profile incidents in the Doctor’s adventures on Earth? Gone, fallen through the cracks in time during Season Five. Everyone in the universe knowing who the Doctor is? Gone, as he faked his death and was deleted from every database in the universe during Season Six. The Doctor being able to solve every problem by waving his giant reputation around? Gone: after Season Seven’s “Asylum of the Daleks,” even his greatest enemies don’t know who he is anymore. Finally, in “The Day of the Doctor“—Matt Smith’s penultimate episode—Moffat undid the core character trait of Davies’ rebooted Doctor: his survivor’s guilt. The Doctor didn’t destroy Gallifrey in the Time War: in fact, he saved it. He’s not the “lonely angel” anymore; he’s not the warrior “soaked in the blood of a billion galaxies”; he’s not even the Last of the Time Lords. It wasn’t always pretty, it didn’t always make sense, and—like any good reconstruction project—it created as many messes as it cleaned up. However—though I enjoyed the Davies era, and think the emotional baggage was key to re-introducing the Doctor to a modern audience—I’m generally in favor of the Moffat Masterplan: the guilt was getting old, the “lonely angel” thing was played out, the Doctor solving problems with his fearsome reputation was overused, and the possibility of Gallifrey’s return opens up a world of stories that was previously closed off. Matt Smith’s last episode, “The Time of the Doctor,” snipped some of the dangling threads and swept up some of the leftover parts from the reconstruction. And then it had one bit of major reworking to do: it gave us a radically different Doctor than we’d seen in over 20 years. Thirty-year-old Matt Smith suddenly disappeared, and in his place was a grey-haired man in his mid-50s. Who is this guy? He’s so OLD. Matt Smith was brilliant in his own right, but in this regard he also represented a clever bit of transitional casting: Amy Pond (Karen Gillen) lusted after him for a while—the way other companions had done when Davies was showrunner—but even she eventually realized that he just wasn’t that kind of guy. With his reconstruction project nearly complete, getting rid of the idea of the Doctor as a potential love interest or sexual partner for 20-something women was clearly Moffat’s next priority. Peter Capaldi is a very attractive man, and I’m sure he makes plenty of fans swoon, but he’s 56 years old: he’s actually a few months older than William Hartnell was when he first played the grandfatherly First Doctor in 1963, making him the oldest inheritor of the role so far. But I digress: my point is, this was always going to be a difficult regeneration. “A whopper,” as a very special guest-star dubs it late in “Deep Breath.” As we enter Season Eight, nearly everything about Doctor Who has changed from what the show had become over the past decade. Some fans are going to have trouble adjusting, and Moffat knows that. Instead, “Deep Breath” is almost entirely dedicated to convincing us to give Capaldi a chance, and lecturing us on what loving the Doctor truly means. Nearly everything in this episode is a metaphor, none of it is very subtle, and a lot of it is downright condescending. 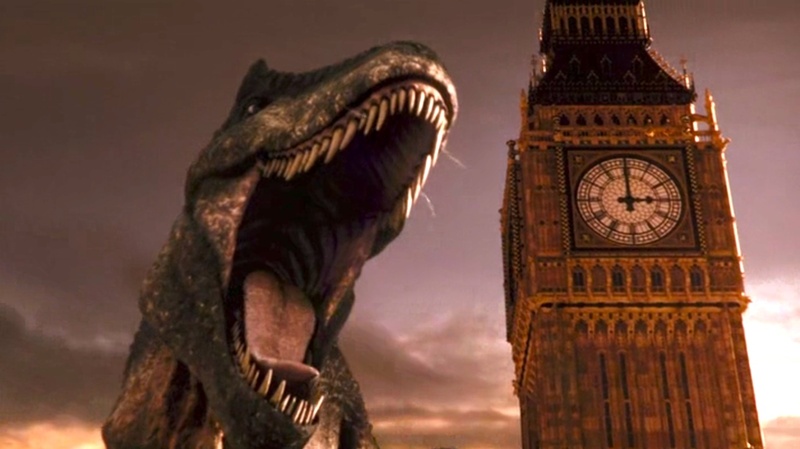 As the episode opens, a dinosaur is roaming Victorian London—a dinosaur, it turns out, that has actually swallowed the TARDIS. It’s not the most flattering parallel Moffat could make to Capaldi’s taking over Doctor Who, but it’s a little clever, and it’s definitely intended. Have you ever seen the like, someone asks? 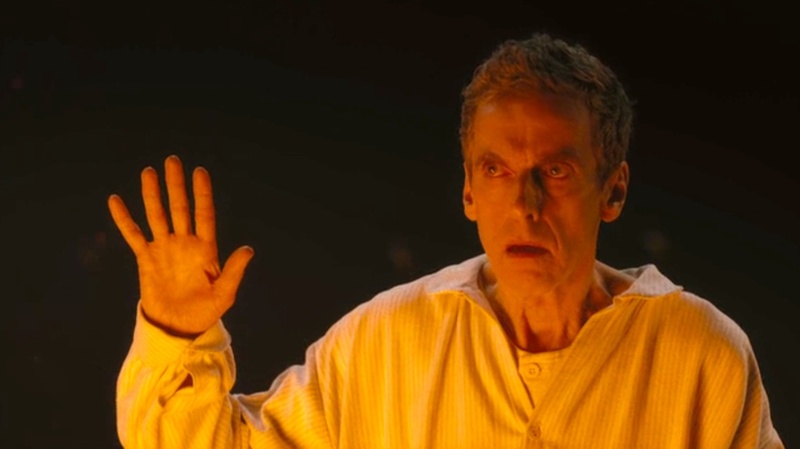 “Not since I was a little girl,” Madame Vastra (Neve McIntosh) says—a line that serves double-meaning, literally referencing her own prehistoric origins, but figuratively reminding us that even the older fans were children the last time they saw such an ancient creature as Capaldi operating the TARDIS. Later, a delirious Doctor “translates” for the dinosaur: “Can’t see me, doesn’t see me,” which is then called back throughout when both Vastra and the Doctor accuse Clara (Jenna Coleman) of not being able to “see” him now. The Doctor and the dinosaur are spiritual twins, just misunderstood ancient creatures unfairly judged by shallow onlookers. 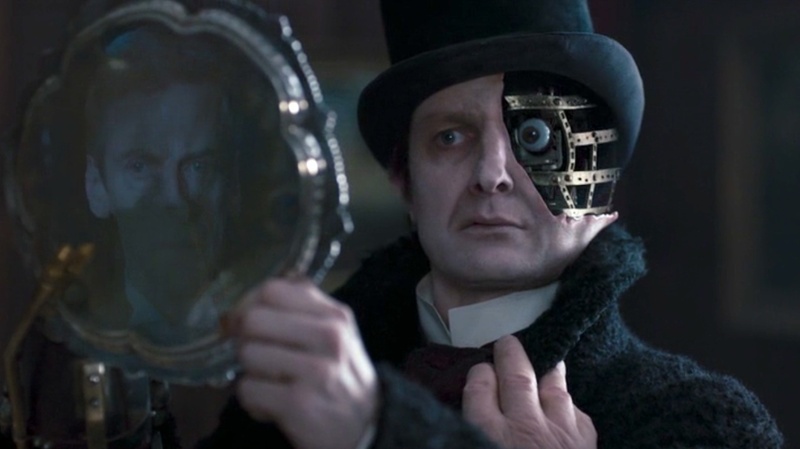 A more interesting metaphor for the Doctor—and the show—comes in the form of “the Half-Face Man” (Peter Ferdinando), an ancient automaton (and relation of the Clockwork Men from the second story Moffat wrote, “The Girl in the Fireplace”). The Half-Face Man has spent millions of years keeping himself alive by replacing bits of himself from the “spare parts” of other people. “You are a broom,” the Doctor tells him. Once again, in case we miss the metaphor, we get it underlined unmistakably—this time in a shot framing a reflection of the Doctor’s face with that of the Half-Face Man. But it’s an important question for the Doctor, the question everyone is asking after a regeneration: once you’ve replaced everything, are you still the same man? And it’s an important question for Doctor Who: fifty years later, after every actor, every writer, every producer, every piece of music, every prop and screwdriver and piece of the TARDIS has been replaced, over and over again, is it really the same show? Can it ever really be the same show? We can hear in this, I think, I little of the motive behind the Moffat Masterplan: the show had changed so much that it seemed to bear, at times, very little resemblance to the show it used to be. “There’s more human in you than machine,” the Doctor tells the Half-Face Man—and this, too, has been a criticism of the era of New Who: the Doctor has become too normal, too relatable, too human. 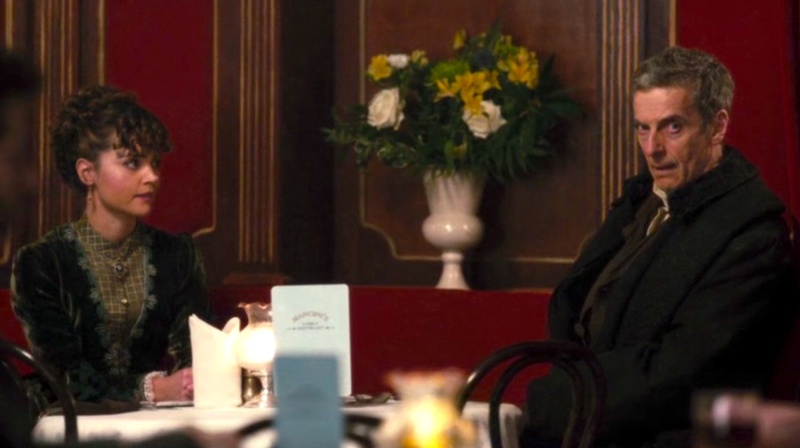 In the conversation between Vastra and Clara, Moffat pushes the meta-commentary about as far as it can go—the conversation starting to resemble an angry comment thread on a website—as Clara rejects the notion that she’s just a shallow fangirl. Ultimately, however, Clara still needs reassurance about the Doctor from someone she trusts: the Doctor. I have mixed feelings about the inclusion of Matt Smith in this episode. 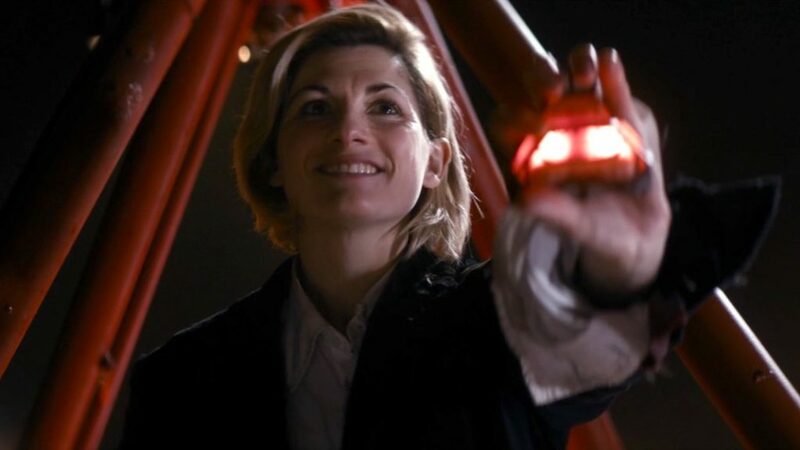 On the one hand, it was a pleasant surprise, and one would have to be made of stone not to be touched by this final gesture—and final goodbye—from the Eleventh Doctor to her, and to us. He stops by just long enough to say, I know you have doubts, but trust me: he’s the Doctor. On the other hand, however, the call fills an emotional gap that shouldn’t be there at all: we shouldn’t need this in-person passing of the baton if we’re really going to believe Capaldi in the role. It’s another example of Moffat speaking down to the fans a little bit, and telling us how to react instead of trusting us—and himself—to make the transference of affection from one Doctor to the other. Don’t look backwards, look forwards. Don’t lecture me on how to love the Doctor, and don’t tell me to love the Doctor: make me love him, or we’re going to have a rough road ahead. Most excitingly, I started to get a sense of the new Doctor as the episode proceeded: this guy really is going to be different from anyone we’ve seen in twenty years. 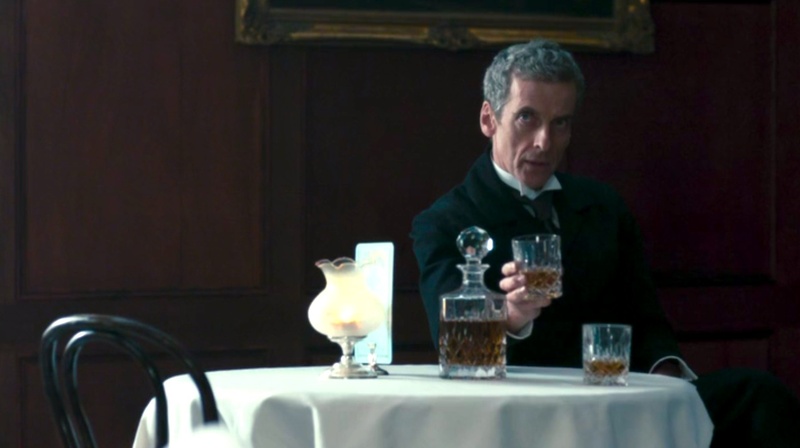 Matt Smith’s Doctor spat out wine like a child; this Doctor pours himself and his enemy a glass of whiskey. (“I’ve got the horrible feeling I’m going to have to kill you. I thought you might appreciate a drink first. I know I would.”) Whether the Doctor does kill the Half-Face Man, or whether he kills himself, is left unanswered, but there are already darker undertones to this Time Lord—in Moffat’s writing, and Capaldi’s performance—that promise to make up for the loss of the Time War guilt. And Capaldi has—in spades—the most important quality of a Doctor: the ability to turn on a dime between very funny, slightly distant, and deadly serious. Welcome to my ongoing coverage of Doctor Who‘s eighth season. If you’ve been reading my Doctor Who reviews for a while, welcome back. If you’re a new reader, I hasten to assure you that I really do love this show to a ridiculous degree: over-analysis and ridiculously high standards are how I express my affection. And yes, my reviews are often this long (or longer), and usually this late (or later): I aim to have them posted 24(ish) hours after the episode airs—so, around 9PM ET on Sunday nights—but sometimes it takes longer. (I’m only a couple of hours late at the moment, which is pretty good for me.) Please bear with me. I’ve going to resist the urge to speculate about what looks like the season-arc mystery, “The Promised Land.” (My speculations are rarely right anyway.) 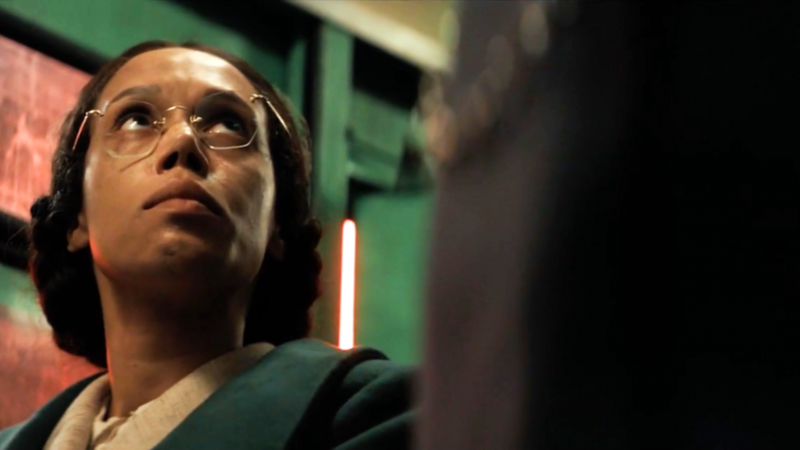 I will, however, speculate on the identity of the woman, “Missy” (Michelle Gomez), whom we meet in the tag. We are given what’s probably a misdirection that this is some future version of Clara (the “boyfriend” line), and I suspect a lot of old-school fans will be wondering (as they did with River Song) if this is the renegade Time Lady known as The Rani. Myself, I hear “Missy” and stretch it out to “Mistress,” and wonder if this is a new, female regeneration of our old friend The Master. A nice gesture to classic Who: Brian Miller, who played Barney the Tramp, was married to Elisabeth Sladen for 43 years, until her untimely death in 2011.